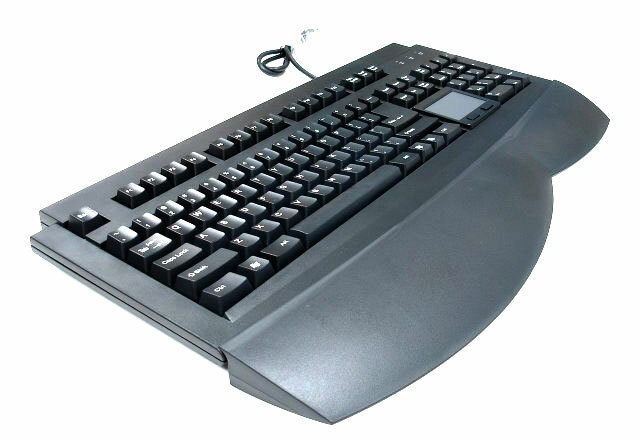 We would like to introduce you to our Ergonomic keyboard with built in Touchpad mouse. 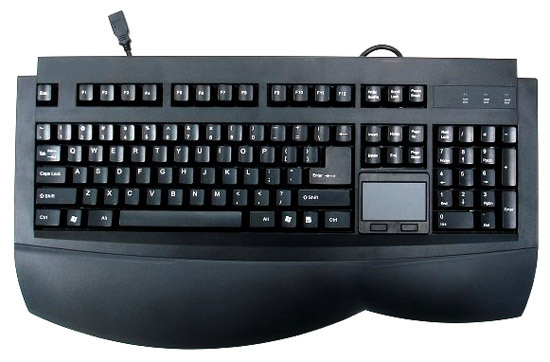 This unique solution offers our customers a keyboard with the touchpad located between the 10 key and the alpha numeric keys, giving you the benefit of a standard keyboard while limiting the shoulder and back pain that can result from constantly reaching for a mouse. Body postures determine which joints and muscles are used in an activity, as well as the amount of force exerted. Poor postures place unusual or excessive forces on components of the body. The number one problem with pointing devices has always been location. In the best of circumstances, pointing devices are placed just to the right of the keyboard, but at worst, they are placed on side surfaces or on the surface in front of the user because there isn't room on the keyboard tray. Our Ergonomic Touchpad Keyboard gives you a 3-in-1 solution for Maximum comfort. A keyboard, A touchpad mouse and a detachable wrist pad support reducing tension in shoulders, arms and wrists.